I was chatting with my buds Heather and Gillian and we were talking about all wanting to try the new Hemlock pattern but weren’t sure how it would look on us with bewbs. Gillian dared us to make the Hemlock. And what do you do when Gillian dares you to something? You do it…or at least I do. I went to The French Seam and bough two awesome knits. The one I used for my hemlock is a Betsy Johnson super light weight knit. It’s either a tissue or a burnout. I don’t know but I can see through the fabric. It isn’t noticeable while wearing. I’m loving my Hemlock. It’s one size and the only alteration I made was to the neckline. I scooped the neck down a bit because I don’t care much for high necklines. Plus, I was thinking it would look better on me having a larger chest. I love the stairs in our new place! …and apparently I love this wall! I have my Grainline Moss skirt traced and ready to muslin but first I need to finish my Steampunk costume for our day out at Faire. I think a moss would look cute with a Hemlock. Juxtaposing the unfitted top with a mini skirt. Yes, please! Add some leggings and you might call that my daily wardrobe wish list. Have you made the Hemlock? If you normally wear fitted tops and dresses, do you ever mix it up and add in any loose fitting clothes? I definitely like mixing things up and after this Hemlock, I don’t think I’ll be afraid of a boxy top, as long as it’s paired with slim fitting jeans or something that contrasts the blousy quality of it. What do you think? How would you mix up a boxy tee? Thank you. Oh yeah, I think a leather skirt would be so awesome! I have some faux leather I might make into a Grainline Moss but I have to muslin the skirt first. You are most welcome! I hope you give it a try. 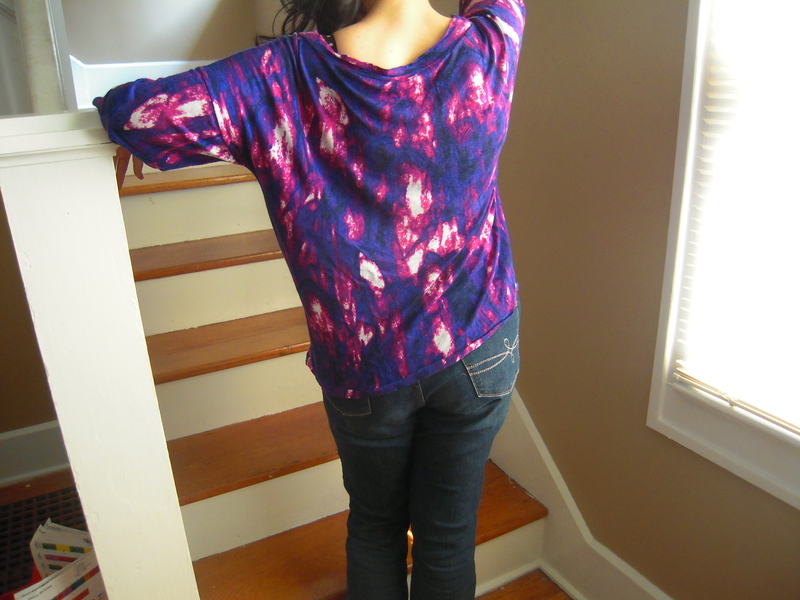 It’s a nice quick make and you’ll get more comfortable with using lightweight knits. Ooh I like it. I’d generally try to avoid really loose things as well but it looks great. Love that fabric. Thanks. I’m thinking the way to go for me is boxy/loose fitting and see thru. 🙂 I kinda did the same thing for my Colette Violet, using a polyester chiffon. didn’t come across as boxy. I love your stairs too! And I’m sure if I met it I’d love the wall too. 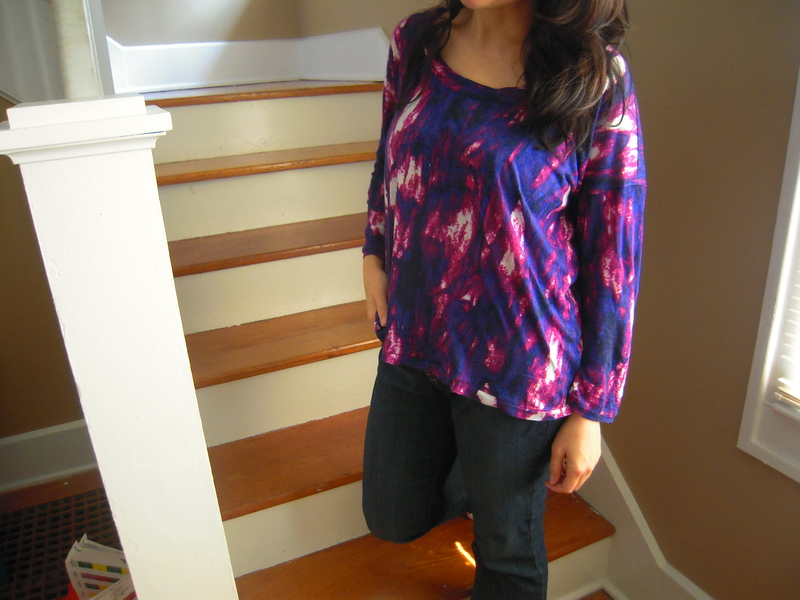 Hemlock tee looks great on you with your changes. The fabric is perfect! This looks great on you and I like the kinda space looking print. Thanks! I’m trying to use more prints in my sewing so it was a stretch for me but I’m liking it a lot. And wearing it a lot, too. I think I do a bit of mixing up in my wardrobe. There are definitely days, like today, where the last thing I feel comfy in is a figure (and gut) hugging top. 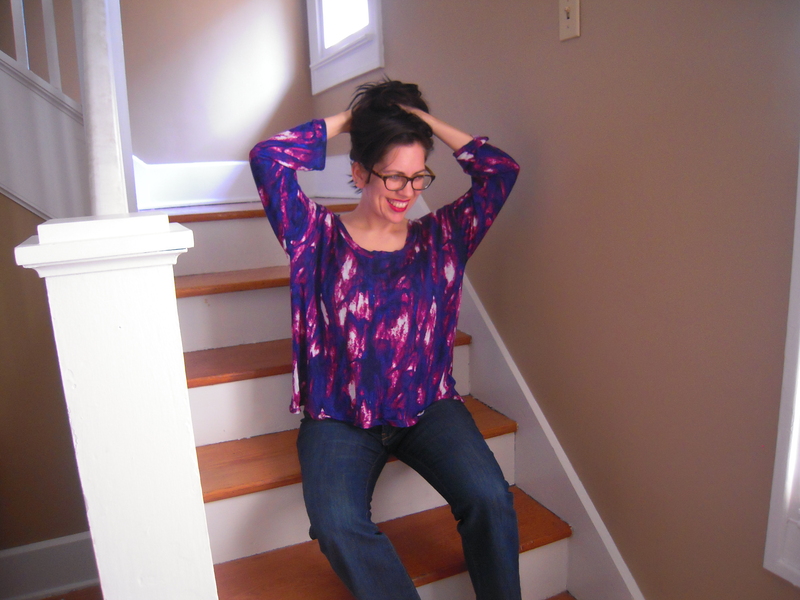 But, I’m following the hard and fast rule of pairing my huge, boxy tunic with slim pants. Exactly! That’s why I like mixing things up. No 80s baggy everywhere thing for me, either. I never say no to a free pattern. You should point me to all those free patterns you say no to. :p I want to play pattern tester. Or pattern maker slash photographer! I’m trying to decide if it would be a good idea to shoot a message to the maker of the pattern you used for that one dress you posted recently. I have no shame. I only have some of the free garment patterns on this pinboard http://www.pinterest.com/lbreton/free-garment-sewing-patterns/ You should totally ask if you can pattern test. That’s usually how I get testing. Awesome, thank you. I mostly want an excuse to figure out how clothing works before I dive into the expensive Spoonflower fabric. oh yeah, that’s a good idea. are you going for knit fabric or woven or either? A bit of both – I have knit fabric in mind for some dresses and tops, cotton poplin for skirts, standard cotton (maybe cotton silk) for shirts/tops. Thank you! 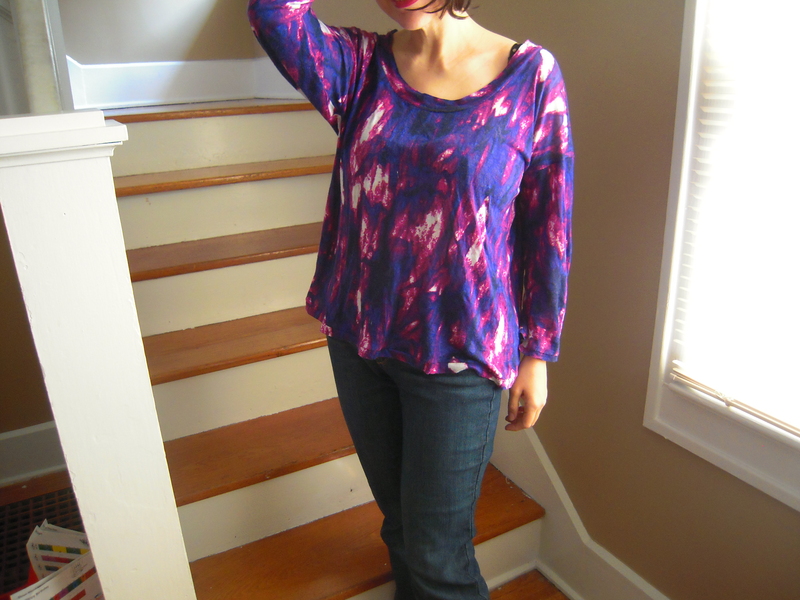 It’s so nice to have a new top from a sewing dare. LOVE this top! scooping the neckline was a good idea, and i’m with ya on pairing boxy tops with fitted bottoms. and p.s. you have the best blog pics ever! I’m really glad I scooped the neck. Might make a curved neck band for the next one but the straight band works just fine. And thanks. I do have fun with the pictures. *throws mic down* Goodnight folks! The top is so fun! I love how casual the boxy style is, and the fabric is so pretty. Your stairs are great! I’m glad I was dared to make it. I’m so glad. The tee looks great on you! I’m apprehensive about boxy tees being an insecure teenager and all but I do own one that I wear with leggings. Thanks! I actually wore a lot of boxy tees as a teenager. I hid behind them when I was feeling insecure. Now, it just feels breezy and comfortable. Looks great on you! I love loose flowing tops especially over jeans and pencil skirts too. Thanks. I’m gonna keep playing around. Oh, that fabric is fab! This is such a super cute top on you- epic work, lady! Thank you! It’s so fun to wear. I was worried that I would look like I was wearing a sack but the knit is so light weight I think it drapes really well. This top looks great on you!! The fabric is just gorgeous. Glad you are loving your new place. Looks nice from the pics. I didn’t realize Betsy Johnson made fabric!? I’m going to have to research that tout de suite. Thanks. It’s such a great place and neighborhood for us. Our next door neighbor has a kid and my kids play together for hours. I think so, too. It feels like my kids are having more of the kind of fun I’d hoped for them…which I feel mixed about but still love it.